New Low Tack Masking TapeThe new high-quality tape creates sharp, straight paint lines on freshly painted and newly plastered surfaces, wallpapers and faux finishes – making it a popular choice for professional decorators and tradesmen who want to achieve a high-quality finish quickly and easily. The tape ensures crisp, clean paint lines and prevents paint bleed which means less time spent on touch-ups saving contractors valuable time and money. Adorn® Low-Tack masking tape is manufactured from a high-quality micro crepe paper that is easy-to-tear and highly flexible, so it’s great for masking around more tricky areas such as curved light fittings. The tape will remove cleanly and easily from surfaces allowing you to apply the tape up to 14 days before you need to paint without leaving a residue. 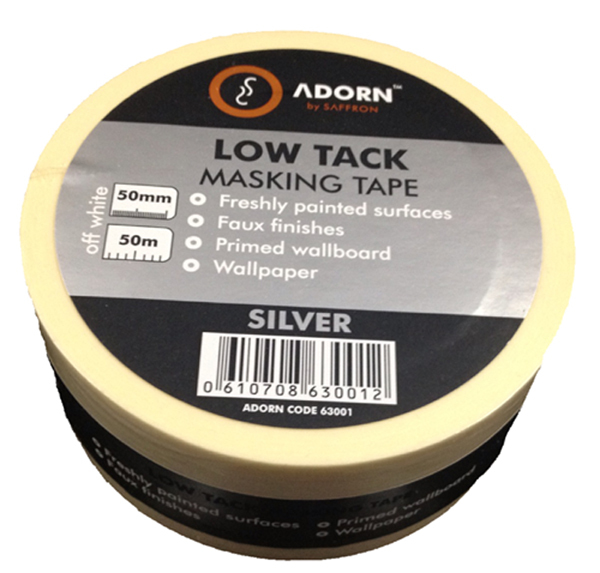 Adorn® Low-Tack masking tape is individually wrapped to preserve the quality and avoid any damage and is available in two sizes - 25mm x 50m and 50mm x 50m rolls. This year, the Adorn® range of products will be exhibited at the annual National Painting and Decorating Show, to be held at Jaguar Hall 1, Ricoh Arena, Coventry CV66GE, United Kingdom – on the 19th and 20th of November, 2013. Visit us at stand 91A to try out our products and get samples. For more information on how to visit and request a visitor pass to the show, get in touch with us – details below. The Adorn® range also includes a range of other decorating tools and accessories. For more information and further stockist details please visit our website or contact us by telephone.